I want to thank all the folks who sent me their stories about how GWRRA has affected their lives. Some of their stories are below. It is so wonderful to know that GWRRA has so positively affected so many people over the years. This organization, or World's Largest Motorcycle Family, really is a second family to many of us. Not only have we made friendships through GWRRA, but we have affected many communities and other organizations, like Charities through all our efforts as well as each other. Now not being one to shy away from the tough questions, I have one for you? Given the fact that GWRRA just celebrated its 35th anniversary, the state of the world and its economy (not saying it's good or bad...you be the judge), and considering your own view of your social life, how important are the GWRRA Chapters to you now and in the future? To put it another way, do you participate in Chapter life? If not why not? Please write me here with your thoughts. GWRRA's concept of bringing Members together through its Chapter concept was the best benefit we had to offer in the beginning. It was the social life for the organization, especially for the Members, and provided a means for our motto, "Friends for FUN, Safety and Knowledge!" The Chapter is the place where Members gathered to get to know others of similar interests, share FUN activities, learn about their bikes and common likes, and get training about riding safely. In many cases the Chapters become our second families. Is this your situation? If you do not participate in a Chapter please tell me why you belong to GWRRA. Is it the benefits, (Wing World, Gold Book, discounts, events, etc. 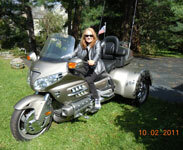 ), web-based information and resources, programs (Rider Ed, etc.) or other reasons. Please write me here and explain. I know GWRRA has spent 35 years training our Volunteer Officers to lead our Chapters properly. Those years as a Chapter Director were some of the most FUN times I can remember in GWRRA. In some of the letters I received this month, and as you can read below, we have many Chapters who have been with us over 30 years. Congratulations and THANK YOU to all our Officers and Chapters for serving our Members all these years! So, my question to you is: If you are involved in a Chapter, what's the best thing about it? If you are not, why not and what can GWRRA do to make that concept more attractive to you? We really want your feedback, so write us, please! Below you will also find an update on some activities in Germany, the upcoming 35th Anniversary Cruise in November and some great Member stories, as well as a continuation of our Member's travelogue. I know when you get this issue, many, many of you will be on your way to Wing Ding. 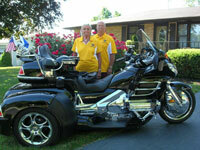 Have a great ride, enjoy the world's biggest Gold Wing convention and have FUN! Sorry I could not be there, but as I write this I am in Brazil with my wife, celebrating the birth of her first granddaughter! And, don't forget to check out GWRRA's Home Page, www.gwrra.org for all the latest and greatest news, events, and Member benefits at GWRRA's benefit page. We hope everyone is enjoying your FREE e-newsletter, Wingin' It, as another benefit of GWRRA; we are always looking to make it better. If you have any suggestions on how to improve your e-newsletter, please write me and let me know. I am still in need of more articles to make each issue interesting to our Members. So, if you have an interesting story about your Chapter and any of it's activities or a great ride you took, or some great Gold Book story, please write me here. And don't worry if you are not a great writer, we have wonderful editors here to make any article sound great! that come with such a family. was enough to keep them together. Remember, send me your best, clean jokes here! was very glad we invested in Rescue Plus! Please send your stories to me here . will have neither freedom nor safety." Rescue towing package from GWRRA. PLUS, it only costs $25 per year to upgrade the entire family!! And remember, non-members can purchase Rescue PLUS for only $50 with all the same benefits! This is a video of Chapter B running with the Patriot Guard in Kansas City to honor Pfc. Cale C Miller who was killed in action. I thought I would post a video of what it is like to ride one of these rides and see the support from the people in the community for our sons or daughters who give the ultimate sacrifice for our country. Enjoy the riding year and be safe, see everyone in a few weeks at WING DING!!!! Almost 10 years ago I was paralyzed in a diving accident. I have since learned to walk with the aid of crutches but I have no feeling in my legs or feet. My life was pretty limited due to lack of mobility and I had to do something to get me out and going again. 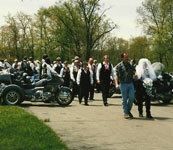 On May 27, 1997 Members from Chapter PA-N were in our wedding. Twenty-four bikes and their riders were lined up so my wife to-be walked between them like walking down the aisle. It was an outdoor wedding and a very hot day. 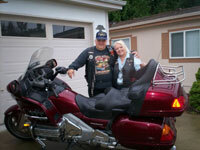 We are both seventy-six now and we still like to ride as much as possible. Needless to say GWRRA, and Chapter PA-N helped make our Golden years much more Golden. There was a write up in Wing World a few months later about our wedding. Thanks GWRRA for 15 years of fun, safety and knowledge. Happy Anniversary to Florida Chapter FL1-M for 30 years of Fun, Safety and Knowledge. 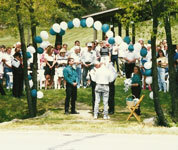 On June 1, 1982 a Charter was issued and a new GWRRA Chapter was formed. We currently still have 2 active original Charter Members, Curtis and Kim Palmore. A lot of memories have been created over the 30 years, including 2011 Florida District and 2011 Region A Chapter of the Year. Also, first runner-up for 2011 International Chapter of the Year. We received a note that IA-A, Des Moines, Iowa celebrated its 30th anniversary on June 1st also. Congratulations to all our Chapters who celebrated such awesome milestones!! Warm greetings from the middle of Europe. My name is Juergen Petri and I am the District Director Germany of GWRRA. I would like to inform you about two events we currently are working on and I would like to invite you to join both activities if possible. I am rather sure that this information might be of specific interest only to those European Members who live close to the center of Europe. I wanted to let you know about a new, exciting feature through our website. You can now chat with a Member Services agent live! Shortly after visiting our home page, a box will appear asking if you would like to chat with one of us here at the Home Office. It is easy to use, especially if you just have a quick question, need some information, or need guidance around our website. When the box pops up just click on it, fill out three pieces of information: your name, membership number, if applicable and for faster results, your email address, then click "Start Chat". You will then be able to type in your questions and a Member Services agent will write back. We want you to check it out and stop by and say "Hi" just to see how it works; we look forward to hearing from you! *Wyndham Hotels - (20% discount at eleven different Wyndham chains including Days Inn, Ramada, Super 8 and more) GWRRA Members save 20% on the best available rates at all Wyndham Hotels worldwide, including Ramada, Wingate, Hawthorne Suites, Days Inn and many more. 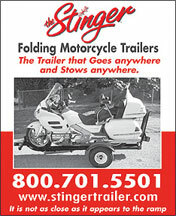 1-877-670-7088, or book online today! Avis Car Rental- You can save up to 25% off your next car rental while experiencing the comfort and reliability that come with renting from Avis. With 4,800 locations in over 140 countries, there's always an Avis nearby to help you with your car rental needs. To rent a car, visit Avis or call toll free at 1-800-331-1212 and remember to use your GWRRA Avis Discount number: B291029 to enjoy these special savings! * Budget Car Rental- Make your budget go further by getting a great deal on a great car from Budget. As a GWRRA Member, you'll get an amazing deal every time you rent - up to 25% off Budget's great rates. To book your car, visit Budget Car Rental or call toll free 1-800-527-0700 and mention the GWRRA BCD number: R198129 to receive your discount. Make the smart choice, rent Budget and start saving today! "How often do you purchase accessories for your motorcycle(s)?" All new Dry Tech Polo Shirt. This moisture wicking polo shirt is great for the coming hot summer months. GWRRA embroidered on the left chest in Metallic Gold.